A data structure is a specialized format for organizing and storing data, so that various operations can be performed on it easily. Any data structure is designed to organize data to suit a specific purpose so that it can be accessed and worked with in appropriate ways. A good algorithm usually comes together with a set of good data structures that allow the algorithm to manipulate the data efficiently. The most common and likely well-known data structure is the array , which contains a contiguous collection of data items that can be accessed by an ordinal index. 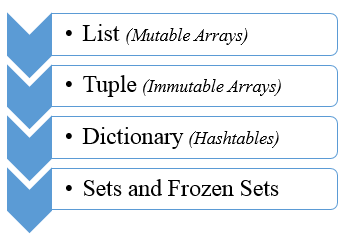 There are four built-in data structures in Python - list, tuple, dictionary and set . You can choose different kinds of data structures depending on what the data involves, if it needs to be modified, or if it's fixed data, and even what access type you would like, such as at the beginning/end/random etc. From the following chapters, we will see how to use each of them and how they make Python programming easier for us.